Fasting week for our church began Monday. I can’t do a full fast because I am breastfeeding. In the early mornings, I go on prayer walks with Catalina (who wakes me up at 5 something! Argh.) I hope I can sustain this. It has been wonderful but this morning I was tempted to go back to bed. 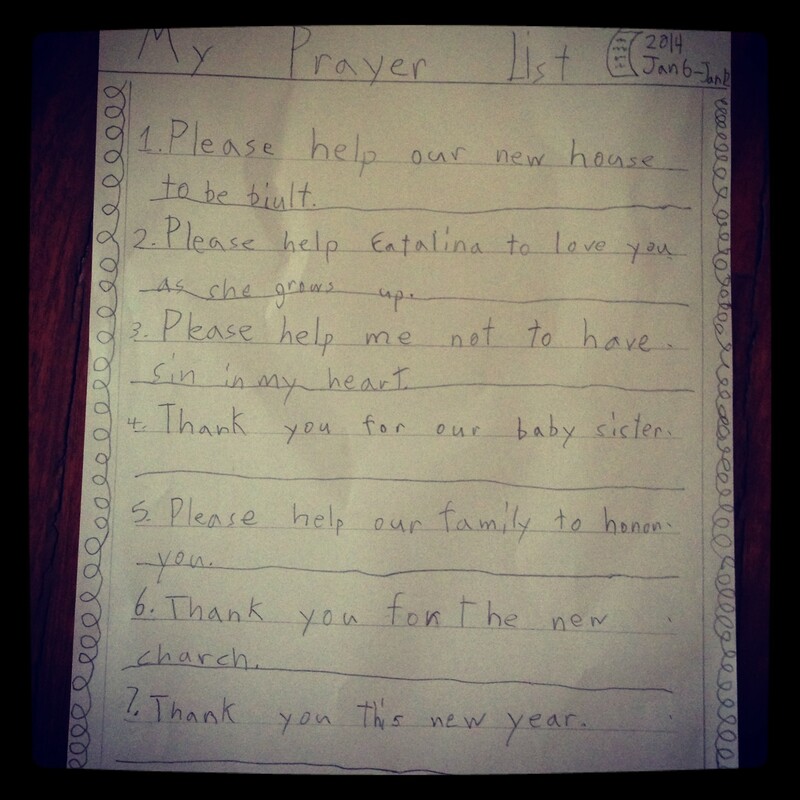 The kids are abstaining from IPads, computers, TV, sweets and junk food, too. 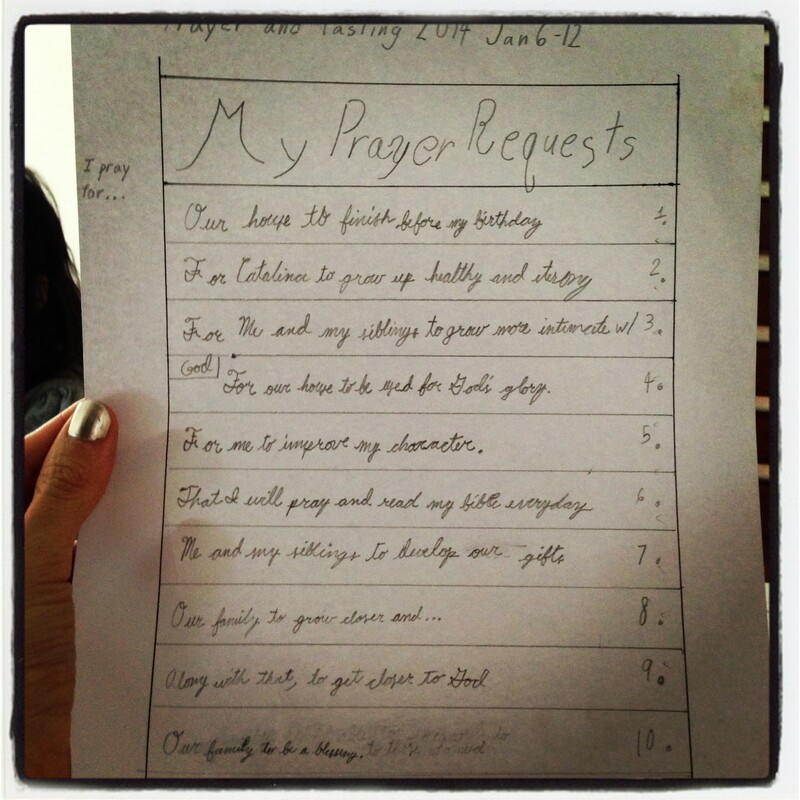 Yesterday I asked the boys to write down their prayer requests. Tiana is still too little to participate but I was very blessed to read what my sons wrote down. 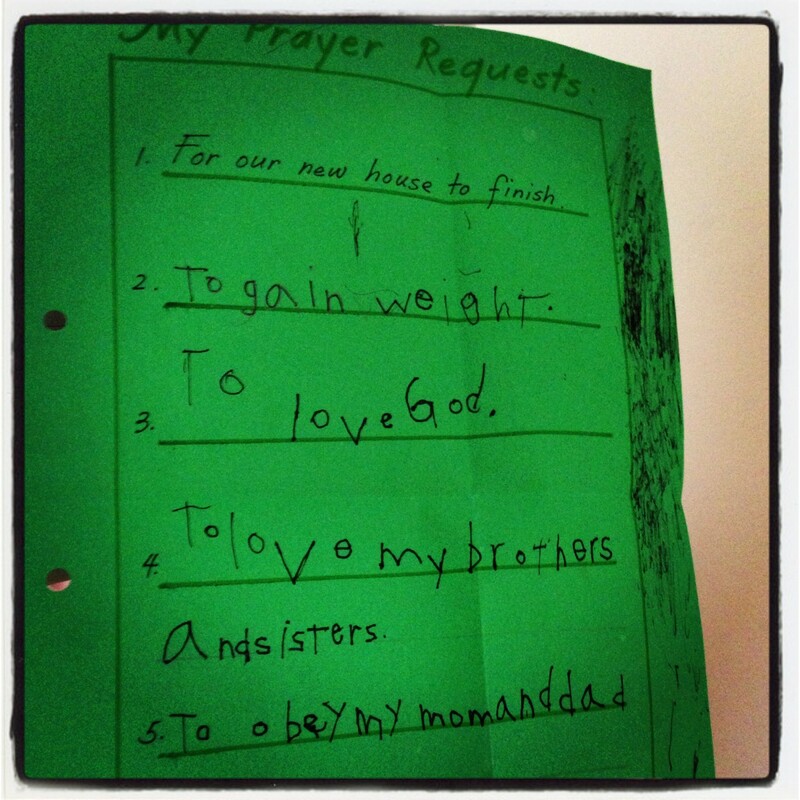 Titus needed some help from me but Elijah and Edan came up with their own lists to pray about. – To be discerning about priorities as God wants him to order them. – To be an excellent TV host and public speaker who can use his talents and platform to further the gospel and attract people to Jesus. – To be full of wisdom as he makes decisions for our family, work, ministry and business endeavors. – To have the supernatural ability to manage all he has to with grace and temperance, being constantly filled with the Holy Spirit. – To be blessed in his efforts to provide for our emotional, relational and physical needs as a family. – To stay pure in heart and turn his eyes away from evil. – To love God above all else. – To live with passion for His work and kingdom. – To be equipped and able as a leader to mentor the men in his discipleship group. – To have understanding and wisdom beyond his years and life experiences so he can guide the men he leads and our family. – To be protected against adultery and wrong kinds of partnerships and connections that will lead him to sin. – To be healthy and strong all the days of his life. – To always process experiences and events from a spiritual perspective. – To honor and obey God in everything he does. – To have God’s hand and favor upon him. – To make time to invest in the lives of our kids and disciple them personally and intentionally. – To be attracted to me forever and to grow old with me in the Lord, serving him and enjoying sweeter and sweeter years together! – To grow up to love God with all their heart, soul, mind and strength. – To be easy to teach and to enjoy learning. – To be healthy and strong. – To be protected from demonic oppression and influences. – To stay pure and guard their hearts from evil. – To be full of wisdom and truth. – To be discerning and make God-honoring choices. – To be obedient and respectful. – To have a love for God’s word and his statutes. – To be influencers who make a difference for Christ. – To be purposeful in their use of their time. – To have favor with God and man. – To have Christ-like character. – To excel academically and be very responsive to my instruction when I am with them. – To become independent learners equipped with the skills to gather information, process and comprehend, communicate and apply, and solve problems creatively and with understanding. – To be handsome, beautiful and talented. – To enjoy working for our family. – To grow in the knowledge of the Lord and to love him. – To be good stewards of the resources entrusted to them. – To care for our children with diligence, patience, and kindness. – To remain trustworthy in their areas of responsibility. – To be joyful and spirit-filled, not giving in to moodiness, laziness, pride or ingratitude. – To have God’s hand of protection upon them and their families. – To be discerning about avoiding relationships with the wrong kinds of men who will take advantage of them. – To receive God’s blessings for their hard work. – To be able to share God’s love and salvation through Christ to those he brings my way. – To know how to present the gospel based on the heart-felt needs and longings of people. – To be able to meet these needs with spiritual truth. – To have daily resolve and energy to teach my kids and spend these precious years discipling their hearts and filling their minds with biblical truth. – To be disciplined with my time so I am effective at using the hours to teach them. – To be more organized and a better planner. – To love God with all my heart. – To be faithful to him until the end of my days and have my heart ready for eternity. – To serve him and others with the gifts he has given me. – To grow as a writer and have daily inspiration to write. – To ably minister to the ladies that God has entrusted into my care. – To be a Christ-filled wife and mother who is a blessing to my husband and children. – To become physically fit and healthy this year by starting an exercise routine and making wise choices about what I eat. If you have prayer requests, please email me. It would be a privilege for me to pray for you. Hi, it would be a privilege to pray for your family 🙂 Reading your blog always makes me want to know God more and live my life for Him. God bless you. Now many site administrators frown upon this and even filter out such comments since it ‘detracts’ from the posted content. complaints or suggestions from your readership. It is such a blessing to read your godly journal entries. I have watched the dove commercial wherein you and your husband was shown, super sweet! Keep inspiring people on how to be good stewards and disciples of the Lord. I would love to read your works. God bless.